I said yesterday that Anthony Watts was scraping the bottom of the barrel for contributors to his wattsupwiththat blog. Who's worse? Christopher Monckton or Tim Ball? Christopher Monckton has the saving grace of being a clown and an entertainer, even a comedian, and makes such idiotic claims that no sane person would believe him. Tim Ball is a dour denier - not that he takes anyone in either. Don’t believe anything you read; Question everything; Be especially suspicious of numbers; Know the source and political bias; If you’re affected by the story get at least three other sources; Remember all government information and data is biased; Be especially wary of stories that cite authorities. The implied threat is the temperature continues its inexorable trend up. The record is 133 years long and with a general warming trend. When would you expect to find the warmest years? Figure 1 provides a hint. The last two decades and so far this one as well, haven't just had rising temperatures, the temperature has been above the long term linear trend line. Not only that, but nine of the ten hottest years have been this century, from 2001 onwards. 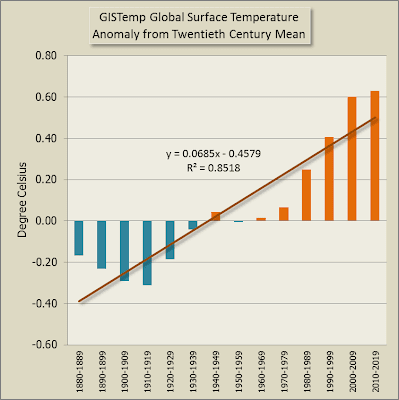 The only other of the ten hottest years and the third hottest year on record, was 1998. Why are they drawing attention to this by focussing on the “ninth warmest”? Because for the last 15 years the trend has leveled and declined slightly in contradiction to their forecast. Figure 2 shows what is actually happening. I'll skip over the bits where he claims that greenhouse gases don't keep earth warm and more of them don't make earth warmer. Tim Ball was a co-author on one of the books that Anthony Watts derides, that tries to prove that greenhouse gases don't exist and the physics of the last couple of centuries is wrong. Now Anthony's getting stuck for people to call on, he'll accept articles from anyone, even "slayers" of dubious character. Let's move onto this bit. How he manages to get so many wrongs in so few words is a wonder! Although the article limits its claim by acknowledging it is only the 9th warmest in the official record, most people believe it is the 9th warmest ever. It is a misconception deliberately created by political activists like Al Gore and not openly refuted by governments. It is like Gore’s claim that CO2 levels are the highest ever when they are actually the lowest in 300 million years. Do most people believe this is the ninth warmest year ever in the history of earth? I very much doubt it, but you never know. I'd think it's more likely that anyone who knew that last year was the ninth or tenth warmest in the instrumental record would also know enough about the world that they'd know earth has been hotter in the distant past. How hot is it? Well, it might be as hot as ever since the beginning of civilisation, or even hotter. 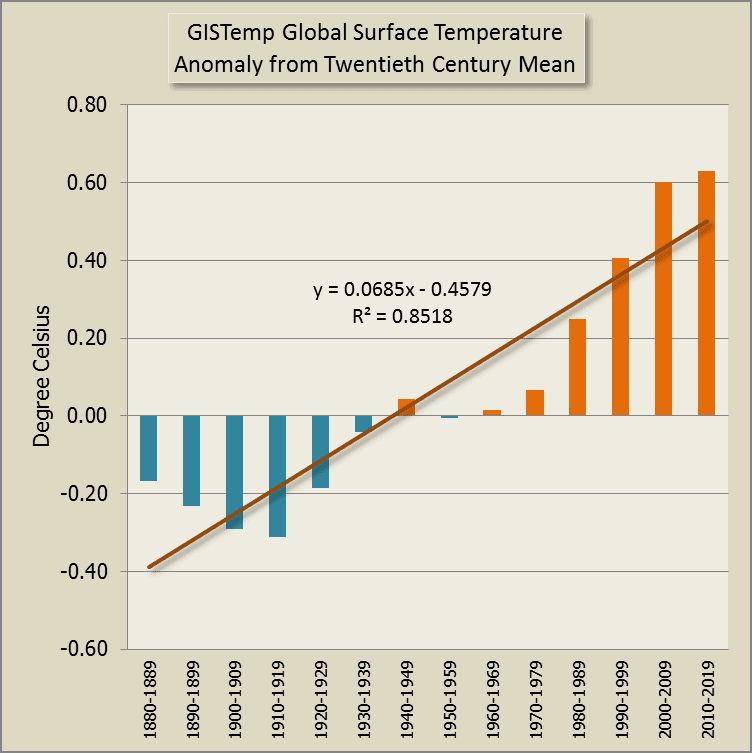 To date the global temperature reconstructions are not at sufficient resolution to say for sure. What is almost certain is that by the end of this century and probably by 2050, the earth will be hotter than ever since the beginning of civilisation. What about his tired reference to Al Gore? Will someone think highly enough of Tim to quietly tell him that "algore is fat" reasons for disputing climate science are a bit passé? It's so "noughties". Now we're in the teens there are some new memes being dreamt up by the denialati. The red line is 400 ppm. 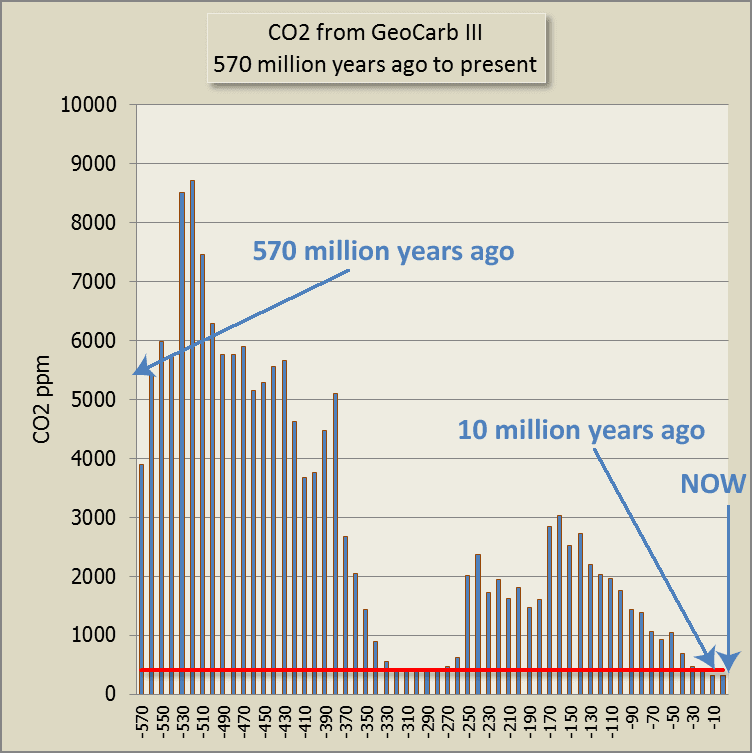 So CO2 hasn't been very much higher than now for going on thirty million years. It likely shot up a bit now and then in those thirty million years. 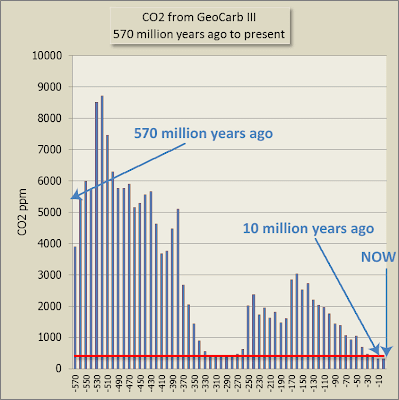 It is very likely that CO2 hasn't been this high for four and a half million years - more than four million years before Homo sapiens evolved. There are fewer than 1000 stations with records of 100 years and most of them are severely compromised by growth of urban areas. Equally important, is the decline in the number of stations they consider suitable, especially after 1990. This pattern also partly explains why the current readings are high (Figure 5). Temperature increases as the number of stations used are reduced. Yeah, right! Why not say the temperature rise is caused by solar panels? The number has grown enormously recently. He's wrong of course. (What did I tell you earlier?) The lack of continuous very long term weather stations is no great impediment to working out temperatures of the past. Not these days. And the decline in the number of stations used in the GISTemp record has less to do with "suitability" and more to do with improvements in algorithms. If a decrease in stations causes the temperature to go up, you've got to wonder why the temperature also went up earlier last century when the number of recording stations increased! Anyway, to help anyone who wants to know more about how GISTemp is constructed, here is a paper by Hansen et al (2010) explaining this and more. Is it not the Ocean heat content that regulates the climate ? 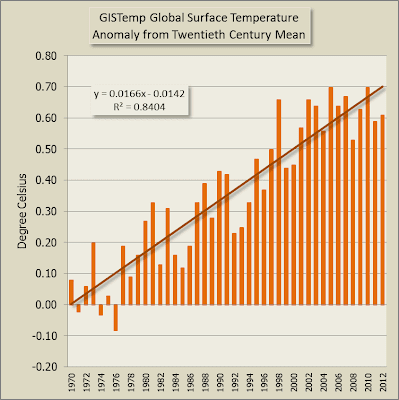 So why are we measuring land surface temperatures.? August 28, 2013 at 12:28 amIt is sad when those who represent We The People are the problem of nearly every problem normal We The People face today.How many still trust their government ? But We The People don’t protest anymore because we fear our government. I do detect a hint of disingenuity in the Tim Ball’s approach. For dramatic effect he chose a 15 month old plot from Climate4you which ends with the lowest T for many years. Climate4you updates its graphs every month. Here in Sydney, Australia, we’ve had the warmest winter in 150 years. I am sure the Observatory in the City is not where it was 150 years ago, and there certainly wasn’t an airport either. It looks like Chris Schoneveld is attempting to sneak some sanity into WUWT (see also his comment on Monckton's article you highlighted). I wonder how long he's allowed to do that. Oh, and Warren Pearce got hit on the head again with his claims about Watts being such a real "skeptic". Again Watts gave a forum to Tim Ball, and this time he even allowed Ball to claim the GHE does not exist. Oh dear, Figure 5 "Number of stations plotted against temperature" is ... dangerous in the hands of individuals who don't know how a global anomaly is computed. It just shows the average of the absolute values of all stations, without taking into how they are distributed. There is a good reason one uses gridded data sets.